Here's How To Drastically Improve Your Public Speaking Ability With Confidence-Boosting, Engagement-Increasing, Results-Oriented Tools, Tips, and Skills... Developed By A Public Speaking Master! Enroll Today And Save 99% Off The Regular Tuition. And finally feel relief from the anxiety, nervous energy, sweaty palms and shaking knees feeling you need to eliminate in order to land your dream job, move up at work, close more sales, or stand up and speak with confidence in any public environment! Get Ready to Learn How You Can Confidently Speak to Any Audience, of Any Size, on Any Topic! 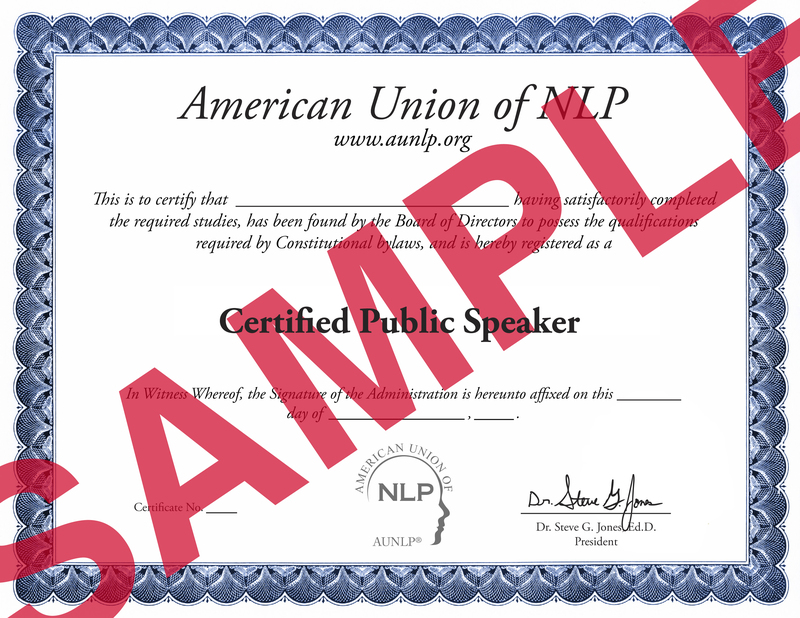 The American Union of NLP is an opening online enrollment in Dr. Steve G. Jones’ basic Public Speaking Certification Course at an incredibly reduced price. Now is the time to learn how to be a better public speaker. This 100% Online, Self-Paced Course Is Guaranteed to Help You Become a Better Public Speaker! Sample Certificate: Click here to see a sample of the certificate. It Doesn’t Matter How Much You Struggle to Prepare or Fear Public Speaking, Your Next Audience Won’t Be Able to Stop Listening to Your Presentation! 5 Instructional Videos, 5 Complete Guidebooks, and a Professional Certification Exam Are Included. 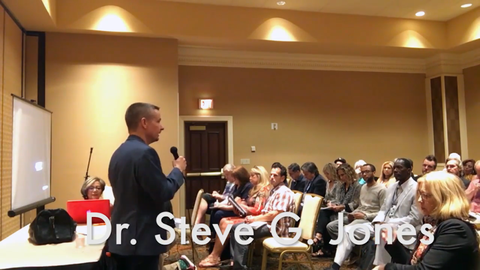 You’ll immediately start your online course with 5 instructional videos where Dr. Steve G. Jones will explain how you can take control of any public speaking situation, improving your confidence, ability to command audience attention, and presentation effectiveness with simple techniques you can immediately implement. Consider the power you’ll have once you’re able to step into any room, any situation, and any environment and speak with authority and confidence about absolutely any topic (provided you’ve followed the included preparation instructions). Course completion and certification is a must have for anyone looking to improve their ability to persuade an audience and confidently deliver information, ideas and perspectives people will actually want to hear. 19+ Practice and preparation strategies you can start putting into action today. Take just one of these techniques (one of the most powerful is called “positive affirmation” and it’s explained on page 20), put it into action, and speak in public like a pro. And you’ll get an inside look at 24+ different ways to engage your audience through the 5 senses. Beyond your voice and body language, there are dozens of sensory ways to capture attention and keep it. You’re about to learn them all! And much, much more in the guide to content, body language, and voice proven to turn absolutely anyone into a master of public presentation. And much more as book 4 concludes with a near complete guide to basic and intermediate eye-contact tools and techniques you can use to make every moment, word, and idea in your presentation or speech count! And complete review of the entire course so you can prepare for your AUNLP certification exam. Once you’ve passed with a 75% correct score on the multiple choice test included with this course, you will submit a 5-minute video speech for Dr. Steve to review. Upon passing, you will be certified by the AUNLP. Click Above to Enroll Today. Don’t Miss This Opportunity to Earn the Public Speaking Certification that Will Leave Any Audience Practically Begging to Hear Your Next Speech.